Explanation: This delightfully detailed false color image of Saturn has been earmarked to celebrate the 8th anniversary of the orbiting Hubble Space Telescope. 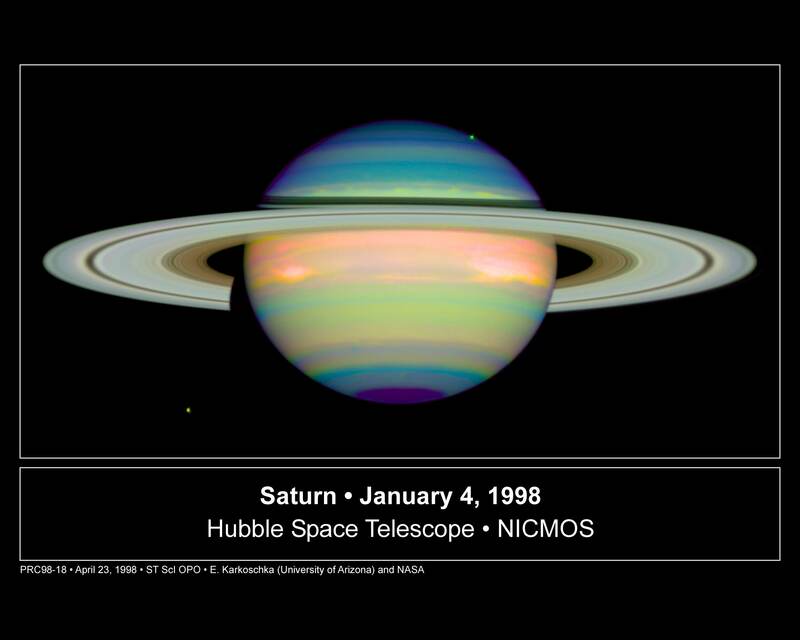 The picture is a combination of three images taken in January of this year with the Hubble's new NICMOS instrument and shows the lovely ringed planet in reflected infrared light. Different colors indicated varying heights and compositions of cloud layers generally thought to consist of ammonia ice crystals. The eye-catching rings cast a shadow on Saturn's upper hemisphere, while the bright stripe seen within the left portion of the shadow is infrared sunlight streaming through the large gap in the rings known as the Cassini Division. Two of Saturn's many moons have also put in an appearance, Tethys just beyond the planet's disk at the upper right, and Dione at the lower left.